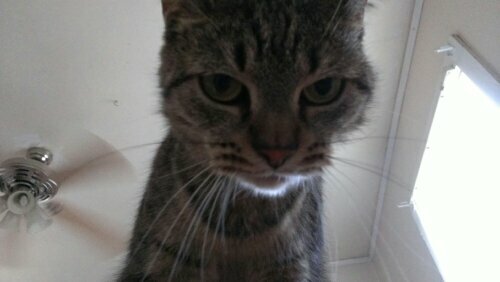 My cat loves to greet me every morning. This is the face I woke up to today. A beautifully demanding face! Love it! My cat used to sit on my chest and just purr as loudly as should could until I woke up. So then I stopped letting her in the bedroom so instead she paws/scratches at the door crying until I get up and feed her. Demanding little buggers. “Why are you still in bed when you could be feeding and stroking me”??? I know that face! Time for breakfast … cute!